GBP/USD dropped to the lowest levels since January 15th, when the House of Commons rejected the Brexit deal by a broad margin. Cable is coming down today as Parliament debates the next steps in Brexit and also on USD strength. The technical levels point to further downside. The Technical Confluences Indicator shows that that GBP/USD dropped below 1.2827, which is a dense cluster including the Simple Moving Average 50-1d, the Pivot Point one-month Support 1, the Bollinger Bond 1h-Lower, and more. 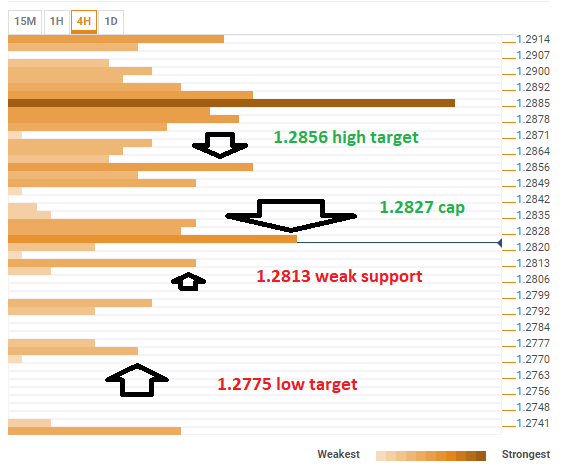 The path of least resistance at this point is to the downside, with some immediate support awaiting at 1.2813. It is weaker than resistance and includes the PP one-day S1 and the fresh low. Further down, 1.2775 is the next target, featuring the Pivot Point one-day S2. On the topside, resistance awaits at 1.2856 where we see the convergence of last week's low, the SMA 50-15m, the SMA 5-15m, and more.